Oberon is the farthest big moon of the planet Uranus. It is made of about half ice and half rock. 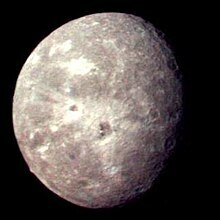 With a mean radius of about 760 km, Oberon is the second biggest moon of Uranus's 27 moons. It orbits Uranus about every 13.4 days. It was found on January 11, 1787 by William Herschel, in the same year he found Titania. It was named after a Oberon, King of the Fairies, a character in William Shakespeare's play A Midsummer Night's Dream. Oberon has several large impact craters where it has been hit by meteorites. These were photographed by the Voyager 2 spacecraft in 1986 as it flew passed. Scientists also believe there is a mountain that could be 20 km (12 mi) high on the moon. Craters on Oberon are named after characters in the plays of William Shakespeare. ↑ "APOD: April 8, 1996 - Uranus's Moon Oberon: Impact World". apod.nasa.gov. Retrieved 2009-05-03. ↑ 2.0 2.1 Hamilton, Calvin. "Oberon, A Moon Of Uranus". www.solarviews.com. Retrieved 2009-05-03. ↑ "Solar System Exploration: Planets: Comparison Chart". solarsystem.nasa.gov. Retrieved 2009-05-03. ↑ Strobell, M. E.; Masursky, H. (March 1987). "New Features Named on the Moon and Uranian Satellites". Abstracts of the Lunar and Planetary Science Conference 18: 964–965. ↑ "Oberon Nomenclature Table Of Contents". Gazetteer of Planetary Nomenclature. USGS Astrogeology. Retrieved 2010-08-30. This page was last changed on 9 March 2015, at 05:21.